Filter your data to focus on a smaller portion of your PivotTable data for in-depth analysis. First, insert one or more slicers for a quick and effective way to filter your data. Slicers have buttons you can click to filter the data, and stay visible with your data, so you always know what fields are shown or hidden in the filtered PivotTable. 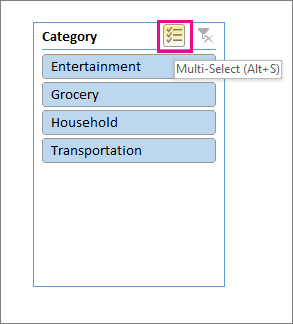 Tip: Now in Excel 2016, you can multi-select slicers by clicking the button on the label as shown above. Select a cell in the PivotTable. Select Analyze > Insert Slicer . Select the fields you want to create slicers for. Then select OK. Select the items you want to show in the PivotTable. Uncheck (Select All) and select the boxes you want to show. Then select OK.
Click anywhere in the PivotTable to show the PivotTable tabs (PivotTable Analyze and Design) on the ribbon. Click PivotTable Analyze > Insert Slicer. In the Insert Slicers dialog box, check the boxes of the fields you want to create slicers for. A slicer appears for each field you checked in the Insert Slicers dialog box. In each slicer, click the items you want to show in the PivotTable. Tip: To change how the slicer looks, click the slicer to show the Slicer tab on the ribbon. You can apply a slicer style or change settings using the various tab options. Use any of the following filtering features instead of or in addition to using slicers to show the exact data you want to analyze. In the PivotTable, click the arrow on Row Labels or Column Labels. In the list of row or column labels, uncheck the (Select All) box at the top of the list, and then check the boxes of the items you want to show in your PivotTable. The filtering arrow changes to this icon to indicate that a filter is applied. Click it to change or clear the filter by clicking Clear Filter From <Field Name>. To remove all filtering at once, click PivotTable Analyze tab > Clear > Clear Filters. By using a report filter, you can quickly display a different set of values in the PivotTable. Items you select in the filter are displayed in the PivotTable, and items that are not selected will be hidden. If you want to display filter pages (the set of values that match the selected report filter items) on separate worksheets, you can specify that option. Click anywhere inside the PivotTable. The PivotTable Fields pane appears. In the PivotTable Field List, click on the field in an area and select Move to Report Filter. You can repeat this step to create more than one report filter. Report filters are displayed above the PivotTable for easy access. To change the order of the fields, in the Filters area, you can either drag the fields to the position that you want, or double-click on a field and select Move Up or Move Down. The order of the report filters will be reflected accordingly in the PivotTable. Click the PivotTable or the associated PivotTable of a PivotChart. Right-click anywhere in the PivotTable, and then click PivotTable Options. To display report filters in rows from top to bottom, select Down, Then Over. To display report filters in columns from left to right, select Over, Then Down. In the Filter fields per column box, type or select the number of fields to display before taking up another column or row (based on the setting of Arrange fields you specified in the previous step). In the PivotTable, click the dropdown arrow next to the report filter. Select the checkboxes next to the items that you want to display in the report. To select all items, click the checkbox next to (Select All). The report filter now displays the filtered items. Click anywhere in the PivotTable (or the associated PivotTable of a PivotChart ) that has one or more report filters. Click PivotTable Analyze (on the ribbon) > Options > Show Report Filter Pages. In the Show Report Filter Pages dialog box, select a report filter field, and then click OK.
You can also apply filters to show the top or bottom 10 values or data that meets the certain conditions. In the PivotTable, click the arrow next to Row Labels or Column Labels. Right-click an item in the selection, and then click Filter > Top 10 or Bottom 10. In the first box, enter a number. To filter by number of items, pick Items. To filter by percentage, pick Percentage. To filter by sum, pick Sum. In the search box, you can optionally search for a particular value. 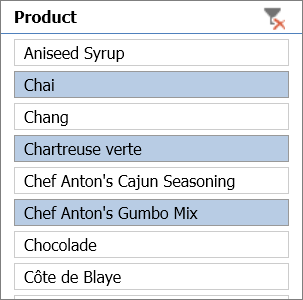 In the PivotTable, select one or more items in the field that you want to filter by selection. Right-click an item in the selection, and then click Filter. To display the selected items, click Keep Only Selected Items. To hide the selected items, click Hide Selected Items. Tip: You can display hidden items again by removing the filter. Right-click another item in the same field, click Filter, and then click Clear Filter. Click anywhere in the PivotTable to show the PivotTable tabs on the ribbon. On the PivotTable Analyze tab, click Options. In the PivotTable Options dialog box, click the Layout tab. In the Layout area, check or uncheck the Allow multiple filters per field box depending on what you need. 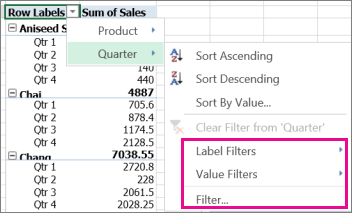 You can view and interact with PivotTables in Excel Online, which includes some manual filtering and using slicers that were created in the Excel desktop application to filter your data. You won’t be able to create new slicers in Excel Online. To apply a manual filter, click the arrow on Row Labels or Column Labels, and then pick the filtering options you want. If your PivotTable has slicers, just click the items you want to show in each slicer. Click Open in Excel and filter your data in the PivotTable.